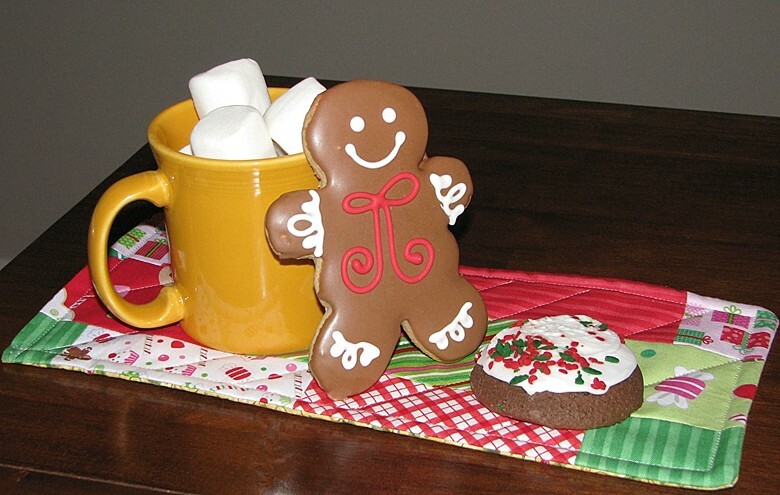 Whether you celebrate Christmas or another holiday, here is a tutorial for an easy mug rug for gift giving. 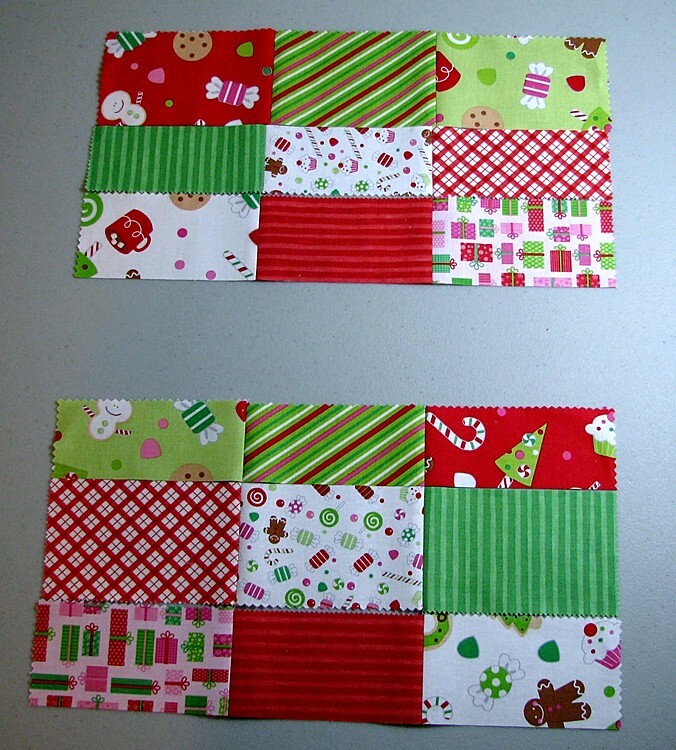 I hit my stash and used nine left-over charm squares (pre-cut 5.5″ squares) which gives me enough for two mug rugs, then I cut two pieces of fabric for the backs. 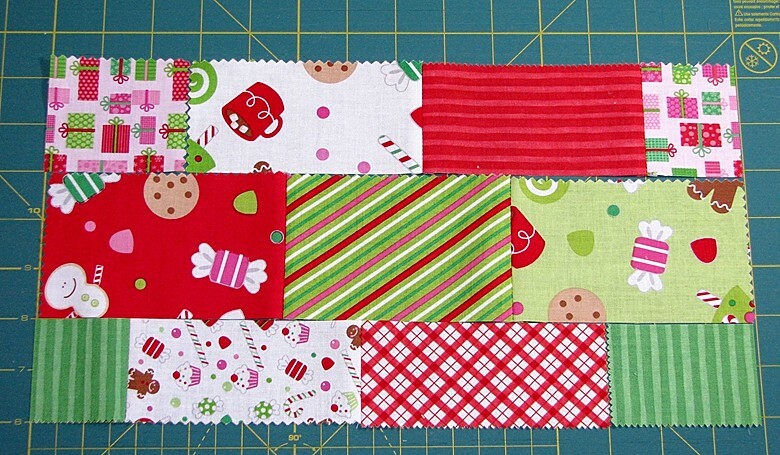 For the piecing, use a 1/4″ seam unless told to do otherwise. 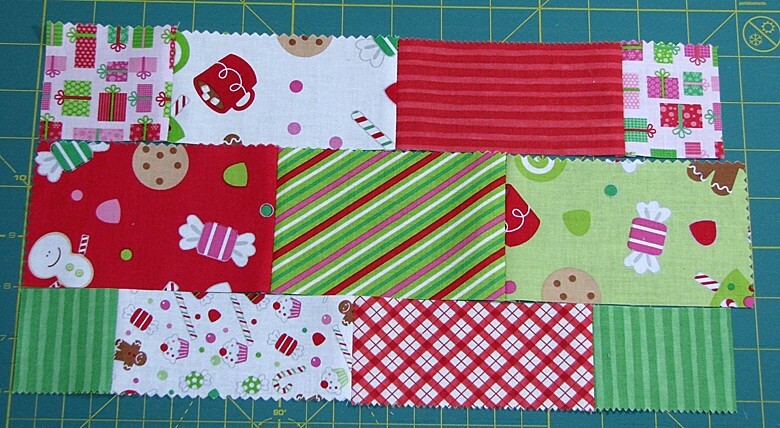 Step 1: Lay out 9 charm squares, in 3 vertical rows of 3, in a pattern that pleases you. 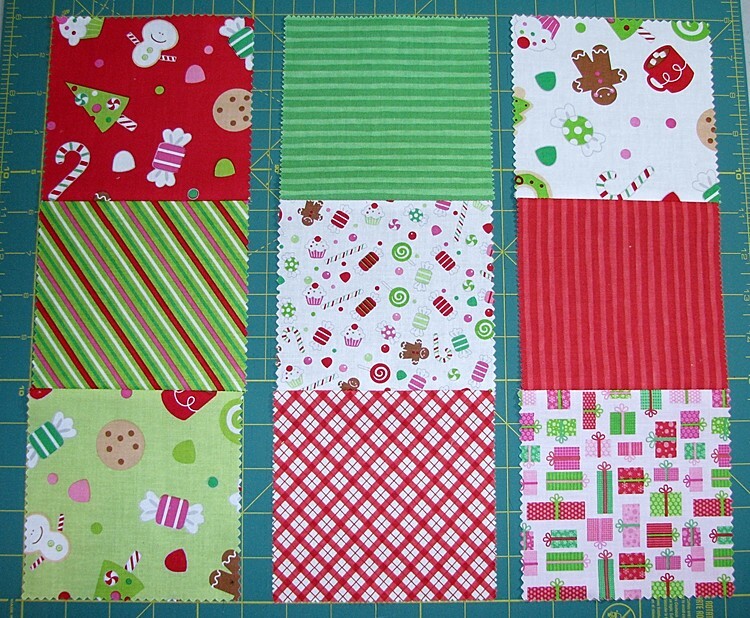 Step 2: Sew the first vertical row of 3 squares together. 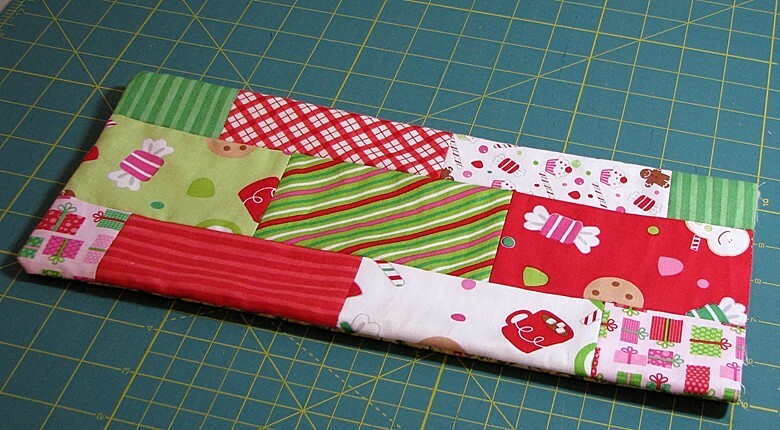 Sew the second row of 3 squares together, then the third row of 3. You now have 3 separate rows of three squares. 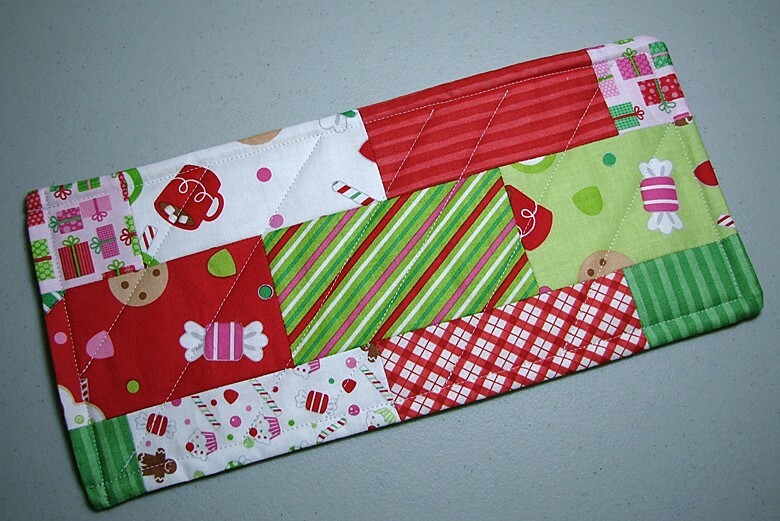 I press all seams open after sewing the squares together to help keep everything as flat as possible. Step 3: Sub cut each row from top to bottom, vertically, to give you 6 strips total. 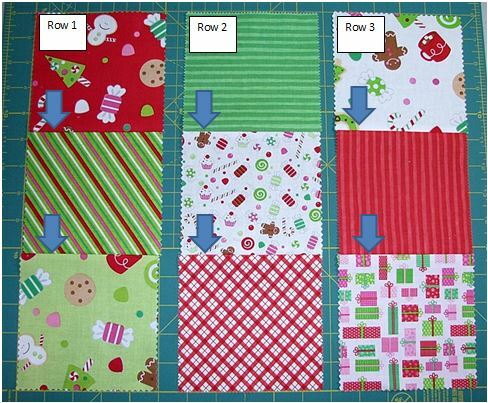 For variety I cut the first strip from rows 1 and 2 – 2 inches wide leaving the second strip 3 1/2 inches wide, and the third row I just cut in half for 2 strips 2 1/2 inches wide. 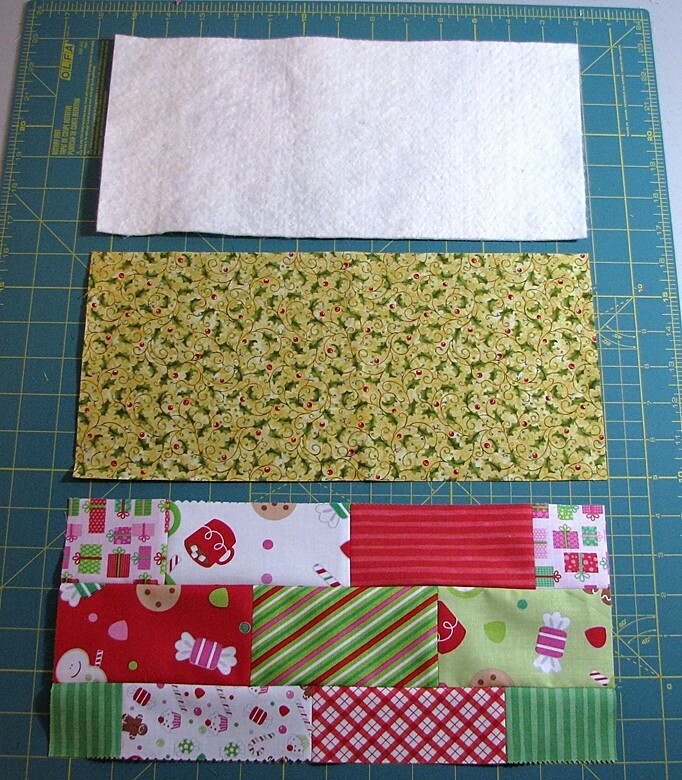 The top one has a 2″ wide strip in the center, the bottom one has a 3 1/2 ” wide strip in the center. 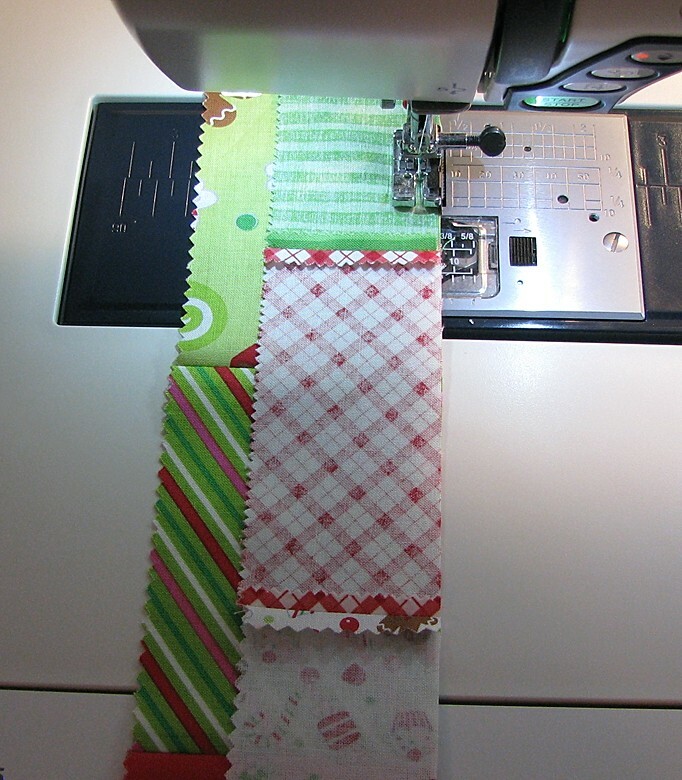 Take your 3 strips and slide them around to stagger where your seams will fall instead of having all of the seams line up. 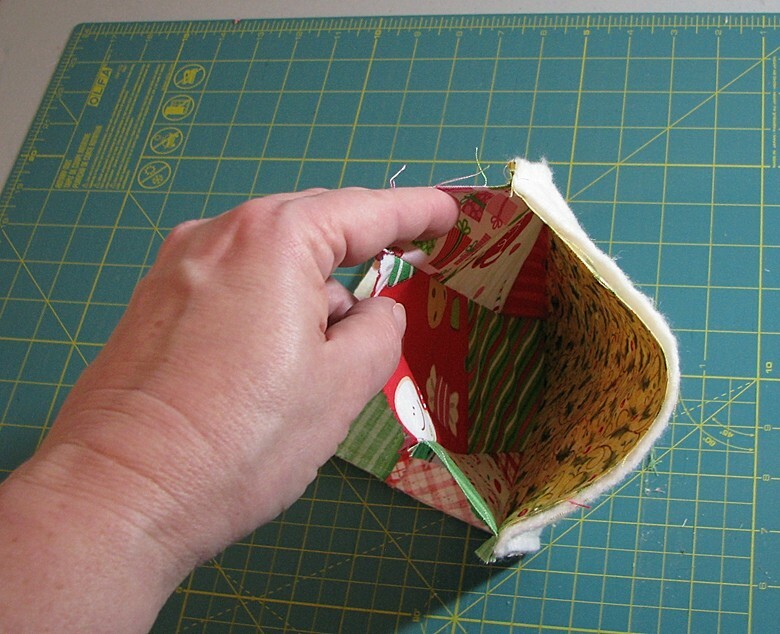 With your ruler and rotary cutter, trim the top strip so that the right edge lines up with the middle strip. Then trim the bottom strip so that the left edge lines up with the middle strip as well. Take the small piece you cut off of the top strip and sew it to the left end of your top strip. 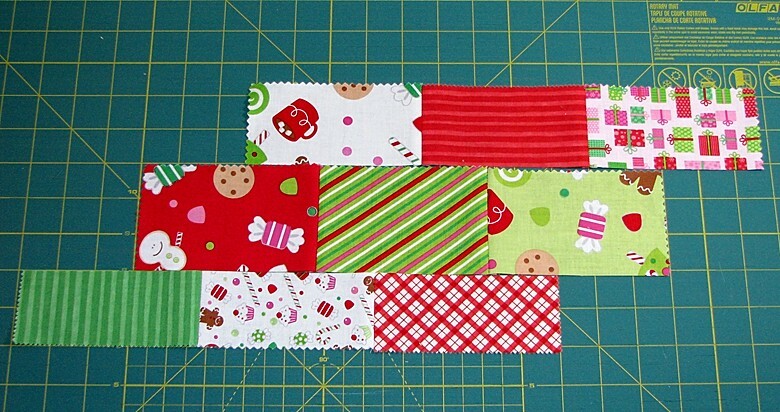 Then take the small piece you cut off of the bottom strip and sew it to the right end of the bottom strip. After you sew the small pieces to the ends of the top and bottom strips, you’ll lose some length due to the seam allowance and the middle strip will now be longer than the top and bottom. 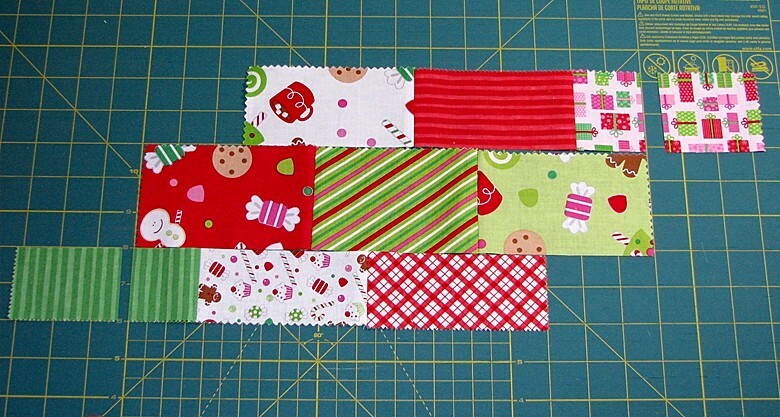 Simply trim the middle strip to align all edges. 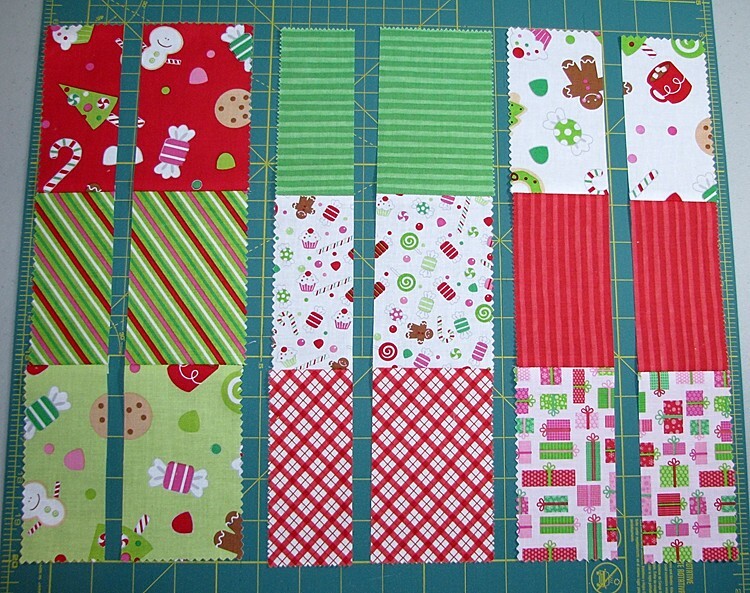 Once all rows are the same length sew the strips together. Press all seams open. Step 6: After you’ve pressed your top flat trim up your edges if needed so that they are the same length, then measure your completed mug rug top. 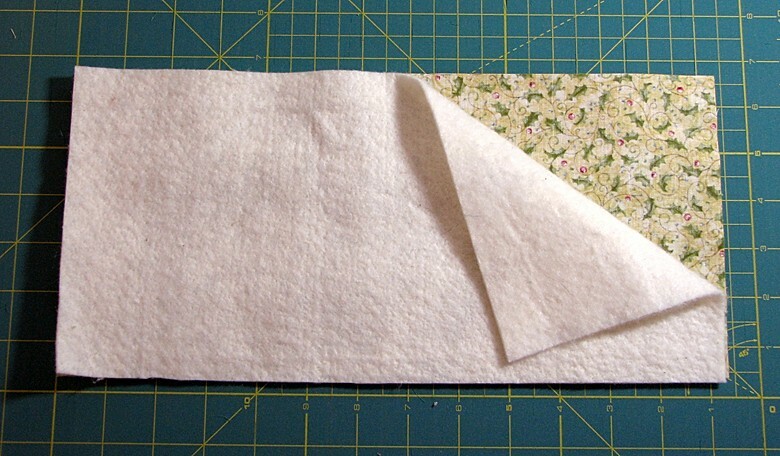 Cut a piece of fabric for the back and cut a piece of thin batting those same dimensions. I use 100% cotton batting. 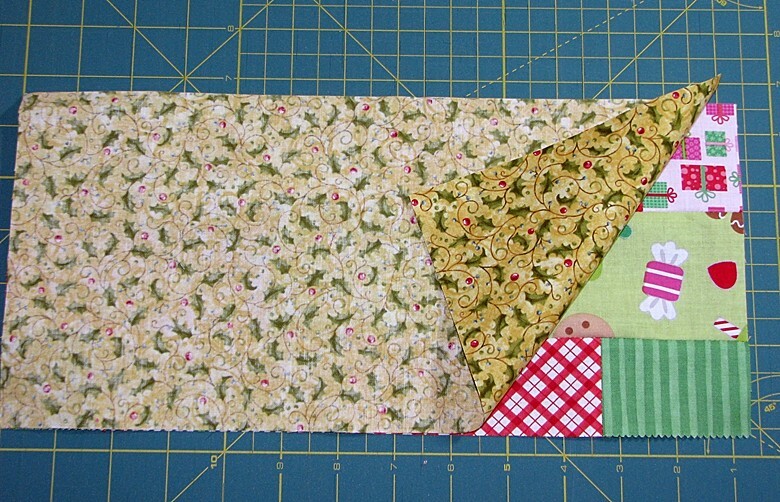 Step 7: Lay the mug rug top and backing right sides together then lay the batting on top of your backing. You now have your 3 layers with the batting on the top. Step 8: Keeping the batting on top (this prevents the feed dogs from tearing it up) leave one short end open and sew 1/4″ seam along one long side, with needle down pivot at the corner, sew the short side, pivot at the next corner, and continue down the other long side. Leave the short end open, do not sew it shut. I back-stitched at the beginning of the first long seam and the end of the second long seam to reinforce them. You now end up with a “tube” that’s open on one end. Step 9: Reach your hand into the tube about three-quarters of the way down and grab a handful of the side of the tube with the backing and batting. Carefully draw the fabric out turning your tube right-side out. Reach your fingers down to the corners and press them out carefully so that they lay nicely (they should be rounded but not too bulky). Step 10: Fold the edges of the open end inside the tube approximately 3/4″ to 1″, whichever seems the easiest for you. Pin the open end shut with the edges folded inside. 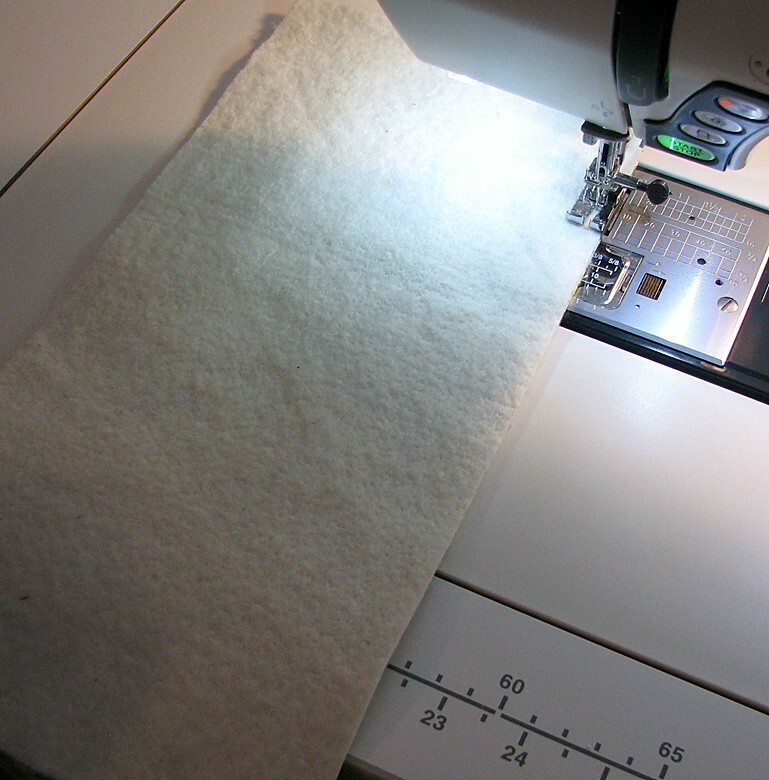 Step 11: Using your walking foot (or setting up your machine as you would for quilting if you don’t use a walking foot), sew the opening closed with a straight stitch approximately 1/2″ from the edge, back stitching at the beginning and end to reinforce. 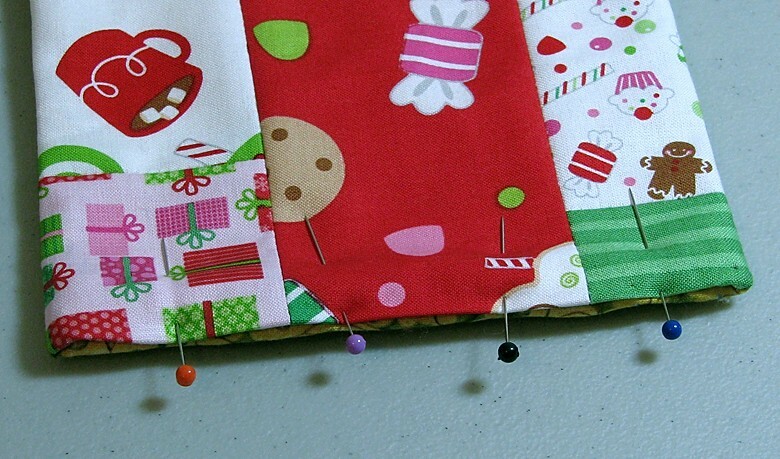 Please be sure to remove each pin as you come to it to avoid hitting it with your needle. 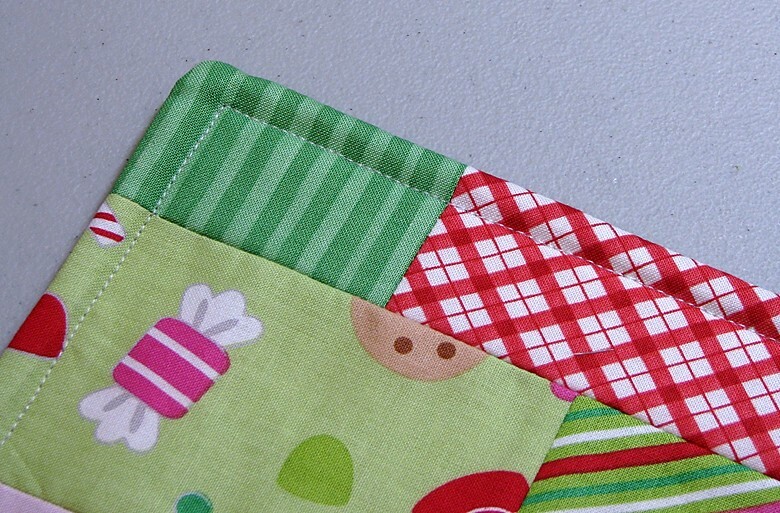 Step 12: Continue to use your walking foot – starting from the edge you sewed shut (you’re sewing through all 3 layers) sew a straight stitch approximately 1/2″ from the edge all around the mug rug, pivoting with your needle down when you get to the corners, then stopping at your closed end. Back stitch at the beginning and ending of your sewing. 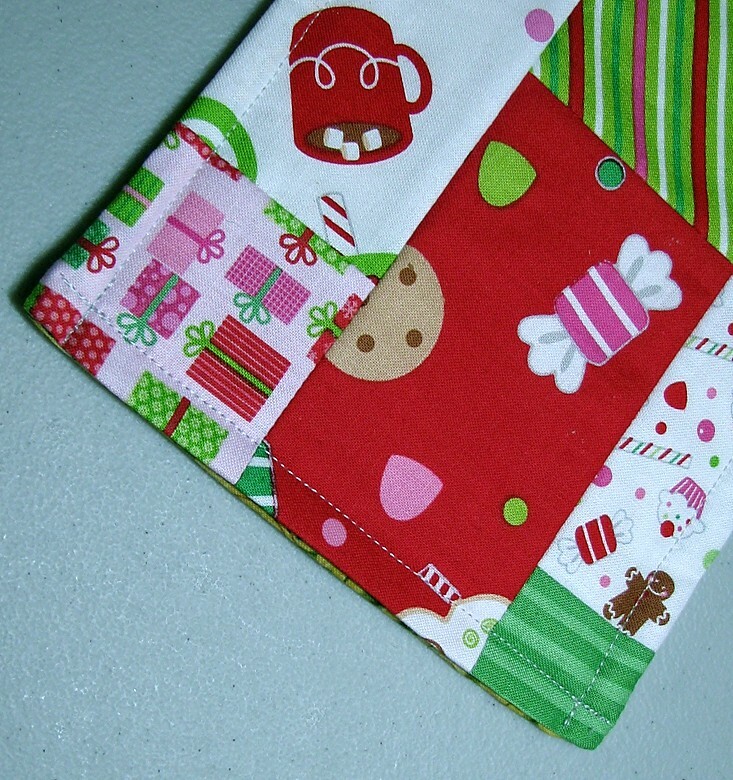 You’ll be making a little puffy edge all around your mug rug. Step 13: Quilt further as desired. If you like the way it looks now you could just stitch in the ditch or echo stitch around some of the rectangles. I ended up just stitching a few diagonal lines through the mug rug. And your done! A fast and simple mug rug that requires no binding yet has an interesting look with the staggered seams and different sized rectangles. Thanks for sharing, I’ll try this for my 1st trial run darning foot, quilting… YEAH! Great idea! Nice practice size. Good luck.